We were truly terrified of the drive back home today. Sure we’d hit a solid wall of traffic. We’d left early on Friday morning, and that had served us well, so we tried to leave “early” again today. That never quite works out for us, when we’ve been visiting my parents. There is the general chaos the kids cause, the feet-dragging on my part because I hate saying goodbye to them (even though in an enclosed space and over a three day holiday weekend, we probably all need some space from each other). By the time we’re rolling out of the parking garage and towards the highway, I’m pretty sad. And it is never early. Today we maybe left at 10:30 a.m.
And yet – and yet- THERE WAS NO TRAFFIC. I guess everyone stays put on Memorial Day, until much later in the day? We even made our rendezvous with our favorite hole-in-the-wall Chinese restaurant in a timely way, right at the midpoint of our trip. Really, the only part of the first half of the trip I’d have skipped was Young J puking in the car and not getting him a bag to do it in right away. He was remarkably calm about it, and he had done us the favor of basically eating nothing all day up until that point, because he hadn’t been feeling well, so cleanup was (according to J, who just finished) not so bad. Last night, J and I met up for ice cream with my friends N and R, not seen for years and years. We attended the same junior high, but I switched schools for high school (as did R) and I had run into N years later in New York, but not for a long while. She’s always made efforts to meet up when I’m in town, and last night things finally aligned. We ate our ice creams and then we opened the tailgate of our car and we just hung out in the parking lot talking until they started shutting off the street lights. It was good to touch the past and the present together, like jumper cables connecting to terminals. It was energizing, this reunion. And it helped me put pieces together. I know that’s pretty much all I’ve been doing this past month (or have I in fact been doing it my whole life? That’s my current Big Question). We got back home and the kids slid into TV, Young J requesting a new show on Netflix that I had to pull teeth to understand was something one of his friends at school watches. Lately there’s been a lot of that mean-spirited Thomas the Tank Engine crap playing so I was hoping this show wouldn’t be quite as bad. It turned out to be about soccer, take place in France, and seemed to be populated by children with no parents around. At first I thought they were all orphans, but then Young J explained they were at some kind of boarding school. I’ll have to sit down and watch an episode with him tomorrow to vet it. It looks… eh. After dinner, J took Young A out on his bike, and Young J and I started drawing a comic together. He loves collaborative drawing projects, and he loves my drawing – something I’ve had to learn to accept as the truth. I grew up convinced I could not draw a thing, and school certainly didn’t convince me differently after elementary was over. I never imagined it would take an 8-year-old – MY 8-year-old – to finally get me to feel less self-conscious about expressing myself through drawing. This is how Young J reels you in, I’m realizing. We share some close moments having fun with a drawing project. Then he asks me to keep him company while he takes a bath. I do. Then he lays on the heavy trip. “Mom, why did you quit your job? Why didn’t you just put it… on hold or something?” I start trying to explain to him the complexity of my situation, the work situation, our financial situation. It was all a little much. Ultimately I told him that if I hadn’t quit it would have been much harder for me to get well as quickly as I have. He still remembers me last fall. I had hoped it had faded like a bad dream, but I don’t think it has. Not enough, anyway. He was wrapped in his bath towel, leaned forward and kissed my nose, like we used to do when he was much younger. While he was putting on PJs he said, “You know, things seem different than they were a couple of years ago.” I asked him in what way. He said, “I never thought you would get cancer. And there have been plane crashes, and that car on fire…” I loved how he brought together the global, the familiar, and the totally random. There was a car on fire down the block – last year. We’d seen it on the way to school. I guess it made an impression. I was crying by this point, and told him what I’ve said here and said to friends: That the thing that feels worst to me is I don’t know how it feels to have a sick parent. I never went through this as a kid. I told him that more than anything I wish I could take away this feeling. But I also made sure to tell him that good and bad things have been happening since the world began. It’s just that at his age, he’s starting to hear about more of the bad ones. 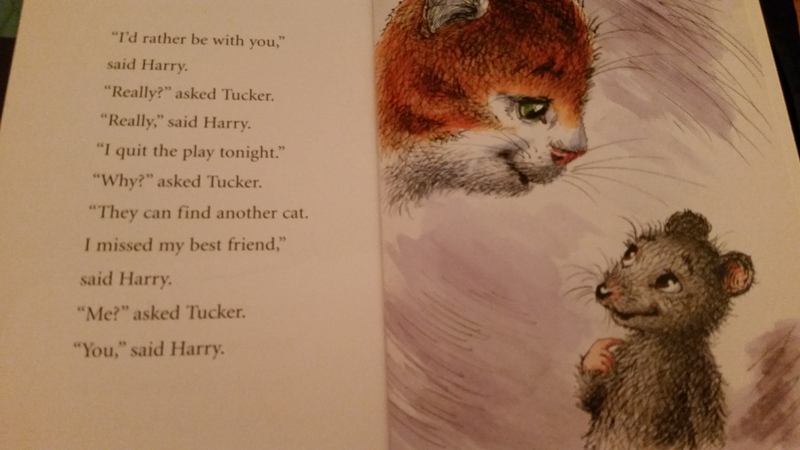 From “Harry Cat and Tucker Mouse: Starring Harry,” by Thea Feldman, illustrated by Olga and Aleksey Ivanov, Based on the books by George Selden and Garth Williams, New York : Square Fish, 2011. I got through the lullaby without crying, then had to scramble for a substitute spray bottle to use for the bad-dreams-away ritual spraying of the bedroom. I found a travel sized one, because my usual spray bottle was outside, cleaning vomit in the car. Turns out they don’t really care what size the spray bottle is, as long as there is one and I follow the proper protocol dictated by Young A (“window-Young A-closet-Young J-door-Mama-spray Daddy later”). I sprayed everything with my empty spray bottle. We’ve been away a few days, it’s possible bad dreams accumulated in the corners. It was the least I could do.